90% of our patients surveyed experience positive results in 2-4 weeks if they qualify. Find out if you will qualify now, stop suffering, you deserve to feel better! Does Parkinson’s, Movement Disorders or Tremors have you stone cold scared? Drugs not working, side effects killing you, don’t want to take drugs? healABILITY: Preservation of health and wellness through the promotion of well-being prevention of disease, and promotion and support of the inherent or innate recuperative abilities of the body. Most doctor’s offices rely on outdated protocols that are 17-20 years behind the basic scientific research. The reason for this is lack of initiative by most doctors, and for medical legal reasons, they will not deviate from typical protocols even when they are outdated and produce terrible results for patients. The focus is not on the individual patient and their unique requirements, instead, the patient is literally pushed from office to office with the goal to just move the responsibility to another doctor or office (usually patients are given more and more drugs, by more and more doctors). We do not treat any disease, instead we focus on your functional neuro-metabolic deficits. We will fight for you and your health! We will provide new possibilities and potential for greater healABILITY, greater depth of understanding, more compassionate listening, and ultimately, superior results aimed at restoring proper function. This, in turn, can have profound and positive improvements for the patients that qualify. Dr. Farley’s Neurobiomedicine Health System can easily be understood when applied to the science of Translational Medicine as described from the National Institutes of Health. Please click here to learn more about Translational Medicine. Most doctor’s offices rely on outdated protocols that are 17-20 years behind the basic scientific research. The reason for this is lack of initiative by most doctors, and for medical legal reasons, they will not deviate from typical protocols even when they are outdated and produce terrible results for patients. The focus is not on the individual patient and their unique requirements, instead, the patient is literally pushed from office to office with the goal to just move the responsibility to another doctor or office (usually patients are given more and more drugs, by more and more doctors). We do not treat any disease, instead we focus on your functional neuro-metabolic deficits. We will fight for you and your health! We will provide new possibilities and potential for greater healABILITY, greater depth of understanding, more compassionate listening, and ultimately, superior results aimed at restoring proper function. This, in turn, can have profound and positive improvements for the patients that qualify. Dr. Farley’s Neurobiomedicine Health System for Parkinson’s can easily be understood when applied to the science of Translational Medicine as described from the National Institutes of Health. Please click here to learn more about Translational Medicine. Most doctor’s offices rely on outdated protocols that are 17-20 years behind the basic scientific research. The reason for this is lack of initiative by most doctors, and for medical legal reasons, they will not deviate from standard protocols even when they are outdated and produce terrible results for patients. The focus is not on the individual patient and their unique requirements, instead, the patient is literally pushed from office to office with the goal to just move the responsibility to another doctor or office (usually patients are given more and more drugs, by more and more doctors). We will fight for you and your health! We will provide new possibilities and potential for greater healABILITY, greater depth of understanding, more compassionate listening, and ultimately, superior results aimed at restoring proper function. This, in turn, can have profound and positive improvements for the patients that qualify. The 8 Hidden Causes your doctor will not tell you about your Parkinson’s Condition! The word Parkinson’s can send a shiver down anyone’s spine with the impending fear of total neuro-degeneration and future disability, both mentally and physically. 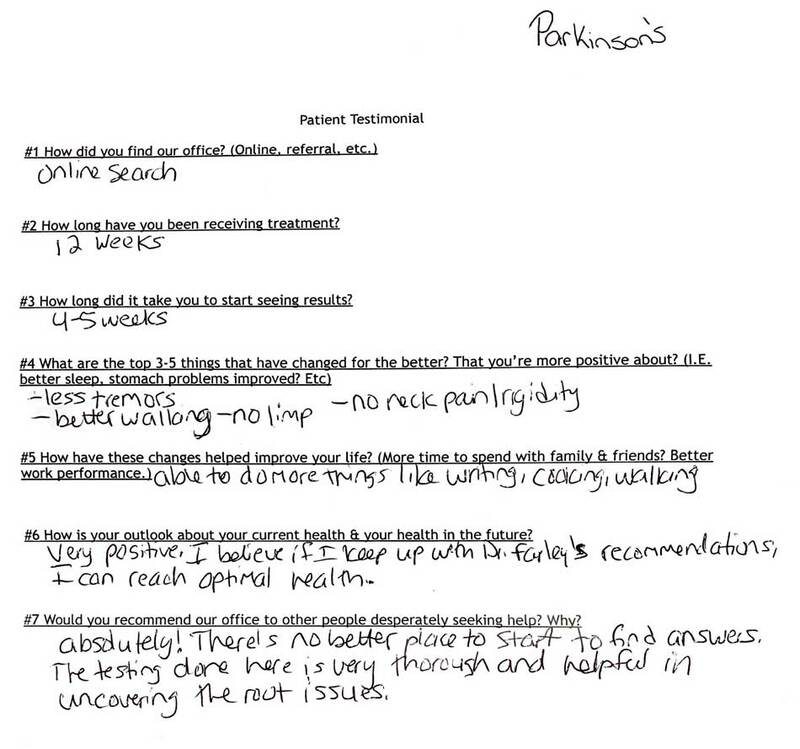 The real question is….do you even have Parkinson’s disease? Have you been told its Parkinsonian syndrome, multiple systems atrophy, essential tremor, or cerebellar ataxia? Or some other neurological problem? Either way, you need to find answers as to why your brain is deteriorating and degenerating so you can have a plan to stop this from worsening and possibly reverse some of these symptoms. Many Parkinson’s patients are diagnosed very late, when in fact early soft signs were apparent 10 to 30 years prior to the diagnosis. Dr. Russell Blaylock, the renowned Neuro-Surgeon, states that the drug mainstay treatment that most patients will receive will almost guarantee they will get worse in 2-5 years, and it even appears to speed the deterioration! “Get worse” and “speed the deterioration”… doesnot sound like great odds. In our office we have identified 8 hidden root functional causes of trans-neuronal degeneration/brain degeneration that must be (and can be) accurately measured to get a proper root functional cause diagnosis. Once we have an accurate root functional cause diagnosis, we can then design a custom treatment plan aimed at getting you lasting resultsto prevent further decline and restore function for many patients that qualify. – Lack of activation- the brain needs physical stimulation (activation) from the body. Have you been checked for this? Most Parkinson’s patients report no! – Low oxygen or anemia. Our office finds that almost 90% of patients have mild to severe low oxygen and anemia they have never been tested for or treated for! – Stable blood sugar is a factor in all chronic diseases. 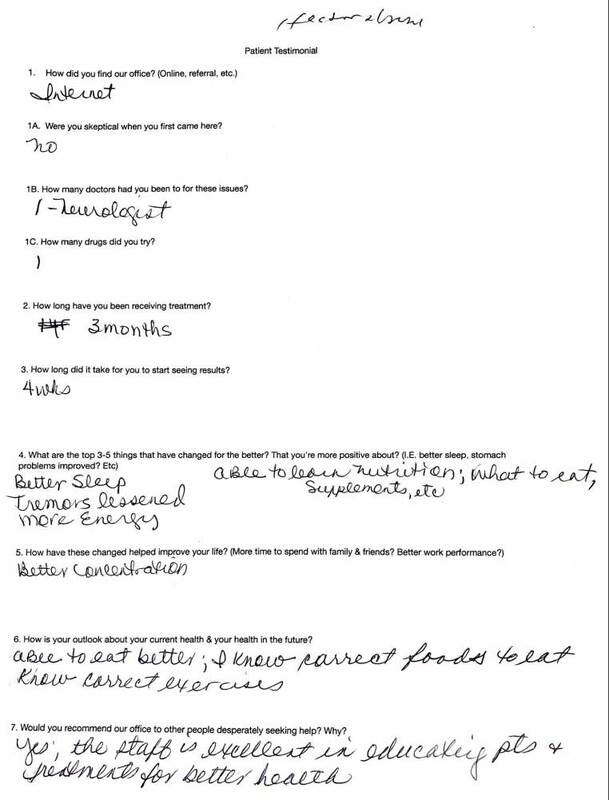 Have you had glucose, HGAIC, LDH, BUN, Triglycerides and a detailed blood sugar questionnaire filled out? It would be rare for this to not be a problem for most Parkinson’s patients. – Liver Detoxification Issues- The liver detoxes 90% of all toxins. If you have a weak dysfunctional liver then this needs to be addressed. – Essential fatty acids and cholesterol levels. Good fats are needed for the brain. 25% of the total brain is made up of cholesterol. Are you taking statins to lower your cholesterol? If yes, this can be a root functional cause for you. – Low glutathione and SOD. These are extremely important at protecting your brain cells. If you have low levels of these,then future degeneration is a definite. You need to know this! – GI problems with or without symptoms. The GI houses 85% of the immune system. The immune system is a big big problem for 100% of Parkinson’s patients, because a sustained inflammatory response is critical to correct. – Poor Methylation- This process requires that our bodies make enough methyl groups or CH3. Without these CH3 methylation groups our brains break down and can never get healthy. It is critical that you find an up to date doctor to help you identify and correct all your root functional causes. To simply not address these, and to instead treat only the symptoms, doesnot seem to work for most patients after 2 to 5 years, and you are likely even speeding up your neuro-degeneration and speeding your deterioration. 3 simple steps…. (1) proper testing, (2) proper root functional cause diagnosis, and (3) a proper treatment plan specific to you and not a PROTOCOL! Protocols do not work for 95% of PTs who will see continued deterioration and their lives slowly, but surely, slip away. Don’t let this happen! Imagine you qualify, imagine this process stopped getting worse, and even imagine you got 25 to 100% improvement…how much better would your life be? The Neuro-Biomedicine approach we use is safe, comprehensive and scientific. Hidden Cause #1 – Lack of activation- the brain needs physical stimulation (activation) from the body. Have you been checked for this? Most Parkinson’s patients report no! Hidden Cause #2 – Low oxygen or anemia. Our office finds that almost 90% of patients have mild to severe low oxygen and anemia they have never been tested for or treated for! Hidden Cause #3 – Stable blood sugar is a factor in all chronic diseases. Have you had glucose, HGAIC, LDH, BUN, Triglycerides and a detailed blood sugar questionnaire filled out? It would be rare for this to not be a problem for most Parkinson’s patients. Hidden Cause #4 – Liver Detoxification Issues- The liver detoxes 90% of all toxins. If you have a weak dysfunctional liver then this needs to be addressed. Hidden Cause #5 – Essential fatty acids and cholesterol levels. Good fats are needed for the brain. 25% of the total brain is made up of cholesterol. Are you taking statins to lower your cholesterol? If yes, this can be a root functional cause for you. Hidden Cause #6 – Low glutathione and SOD. These are extremely important at protecting your brain cells. If you have low levels of these,then future degeneration is a definite. You need to know this! Hidden Cause #7 – GI problems with or without symptoms. The GI houses 85% of the immune system. The immune system is a big big problem for 100% of Parkinson’s patients, because a sustained inflammatory response is critical to correct. Hidden Cause #8 – Poor Methylation- This process requires that our bodies make enough methyl groups or CH3. Without these CH3 methylation groups our brains break down and can never get healthy. We usually see positive results in 2 to 4 weeks if you qualify. We do not guarantee results, but we expect results if you qualify and are compliant with the recommendations. Call now (862) 222-2460 for your Step 1 Free Phone Consultation to see if you qualify. We cannot help everyone, and not all cases will qualify, but we will do our best to assist you or your loved one. Dr. Farley is the leading expert in finding which 30 root functional causes are primary for you. My laboratory has never had anything but an extremely professional and proficient relationship with Dr. Farley and his staff. I believe that in the future more patients will seek care that is based on root functional causes rather than just managing symptoms. 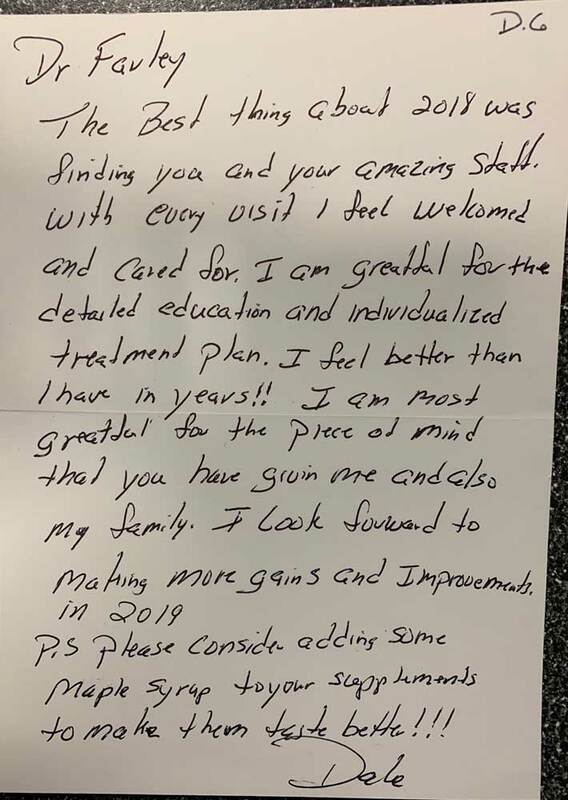 Anyone who uses Dr. Farley today is getting insight, care and a dependable trusting doctor that should be the standard in doctoring across the United States and abroad. I hope that patients can open their minds to understanding these concepts and not dismiss them because their doctor doesn’t know about them. This healABILITY approach is an old and new evidence scientific based approach that frankly most doctors have absolutely no training in. Dr. Farley’s office is run like a fine hotel that provides excellent customer service. So not only will you get exceptional care, but you’ll also be treated with a kind, warm and dependable staff. This book can aid anyone in getting insight into Dr. Farley’s method of functional physiological based approach that has the potential to really help almost any condition. There are 30 key hidden root functional causes. Dr. Farley will help find which one of these 30 root functional causes are most important to correct for you to get well. Each person is unique in their physiology and biochemistry. Dr. Farley is the leading expert in finding which 30 root functional causes are primary for you. Dr. Naveed Ashfaq MD emphasizes how powerful Dr. Farley’s methods are and the impact they have. Fellow in the Royal College of Surgeons FRCS, Diploma in Hospital Management, President of Sterling Clinical Laboratory Inc.
Every patient, doctor and family member should be exploring this question. Sadly, few do! Instead, most stay stubbornly focused on the question of: Am I feeling better from my current treatment; they don’t look to find actual functional root causes. That’s what Dr. Farley has done in Creating healABILITY and his approach to chronic problems. Most patients simply treat each symptom as if it was a separate problem and never look for the interconnection and influence of one system problem on another system problem. They view each area as a separate island. Dr. Farley has worked long and hard at his knowledge and precision to which he applies to each and every patient. 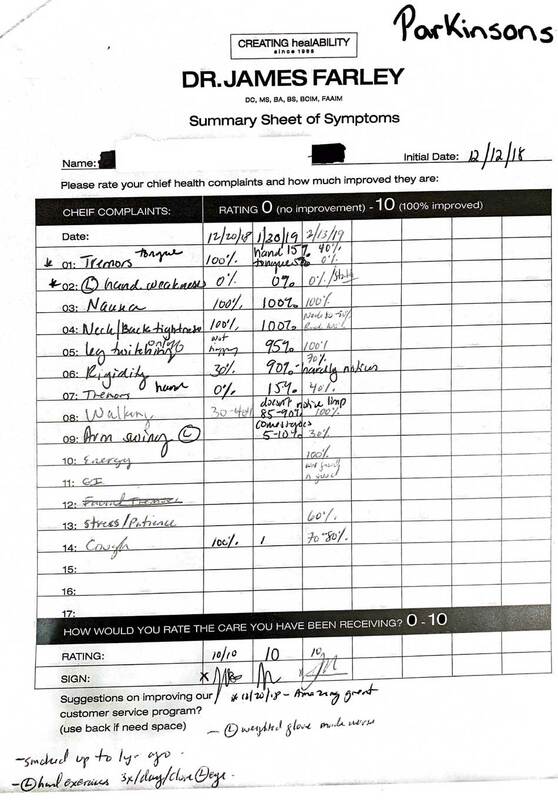 A new patient’s evaluation and testing is much more complete than most doctors. His ability to explain a complex problem in an easy understandable concept, which is healABILITY, is fantastic for patients in helping them understand and get well. In New Jersey Dr. Farley is among the top offices utilizing Sterling Laboratory (my lab) for documenting and tracking patients starting point, improvements and progress. The panels Dr. Farley orders have all been chosen by him to create a full insider look at many complex symptoms, conditions and systems. He regularly does follow up testing that demonstrates significant changes for most patients. Dr. Farley also has many patients return from the general practitioners, endocrinologists, cardiologists, neurologists, gastroenterologists and infectious disease doctors that are totally blown away by the changes he routinely produces with his methods of care. Dr. Abdul Qadir, MD – Pakistan, 1987, MBBS, Bachelor of Medicine and Bachelor of Surgery. 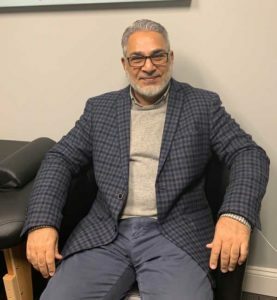 This is a testimonial from Dr. Qadir who runs the Clinlabs Laboratory blood work, and has been working with our office since 2012. Please see below for a information on Clinlabs. 1. The first question is, how does my testing, the expanded health panel, differ from other doctors offices? Your panel is very extensive, and covers almost all the detail of chemistry and complete hematology, vitamins, and minerals. I haven’t seen such a detailed testing, especially in the diagnosis thyroid disorder. A lot of physicians use a holistic approach, but they do not include every marker which you have in the expanded panel. 2. How about the specialty tests that we run? What percentages of offices do you see running tests like that? I’ve noticed in your office that you run a specialty test on almost every one of your patients. Compared to you, other physician’s hardly do any. So maybe 10 percent, or less of other physicians run these specialty tests..
3. You’ve also asked my patients that have gotten care here during follow up blood work how they’re doing because you want to know, can you share your experience in that? Yes, I try to ask almost everyone because you do the first blood work before they start their treatment and then you do it again at the end or the beginning of their second cycle. Almost everyone said that they feel much better and also noticed the huge difference in lab reports between the 1st and 2nd blood work. 4. When you say almost everyone, give me a percentage. I would say 95 percent. Almost 100 percent have mentioned that they have lost weight and they’ve regained energy. Their symptoms have much subsided. Even with being here for their thyroid or as a Hashimoto’s patient, they feel pretty energetic. All their symptoms have subsided. I’ve noticed lately that you have a big number of Parkinson’s patients, and almost everyone of them has said that their tremors has improved. 5. What percentage of people with Parkinson’s have told you that their tremors have improved? 6. Have you ever seen any other office doing the brain based care and the in office cellular energetic treatments that we do? Do you know anyone else putting that type of a program together? No, I haven’t seen. No other physicians do what you do, that I know of. 7. If you wouldn’t mind comment on customer service and customer relations? The customer service is excellent. 8. On a scale of one to 10, what would you give the customer service here? Ten. I would highly recommend your Neuro-Biomedicine program. It is unique, scientific, and provides excellent results for most of the patients I’ve been in contact with. Clinlab provides leading-edge medical laboratory tests and services. Recognized for our innovation, quality, and customer convenience, Clinlab delivers timely, accurate results for improved patient care. Clinlab is a pioneer in applying advances in medicine and science to laboratory testing, with more than 12 years of experience in serving physicians and their patients. Our 2,000 clients include physician offices, hospitals, nursing homes, assisted living facilities, and managed care organizations. Clinlab is a full service lab certified to perform any test that you might request. Our staff is fully qualified and certified. Our lab is OSHA compliant for a safe lab environment. Our fully certified lab is certified by CLIA and the Missouri Department of Health. Clinlab adheres to the guideline and protocols recommended by the College of American Pathologists (CAP) and the American Association of Bioanalysts (AAB). Understanding The Science Behind Neurobiomedicine and Our Approach to Helping You Restore Proper Function… To Ultimately Help You Feel Better, Look Better, and Recover Your Health. The Neuro-Biomedicine approach we use is safe, comprehensive and scientific. We usually see positive results in 2 to 4 weeks. Call now (862) 222-2460 for your Step 1 Free Consultation to see if you qualify. We cannot help everyone, and not all cases will qualify, but we will do our best to assist you or your loved one.